Located in the great state of Minnesota, we work mainly in the Twin Cities but love to travel. It is that time of year again. The time where the weather is nice & all you want to do is spend every second you can soaking up it up. Before we know it, it will be snowing again. I know, I should hush up & not jinx it. lol We spend 90% of our time outside when it is nice out. Chalk is one of our favorite things. 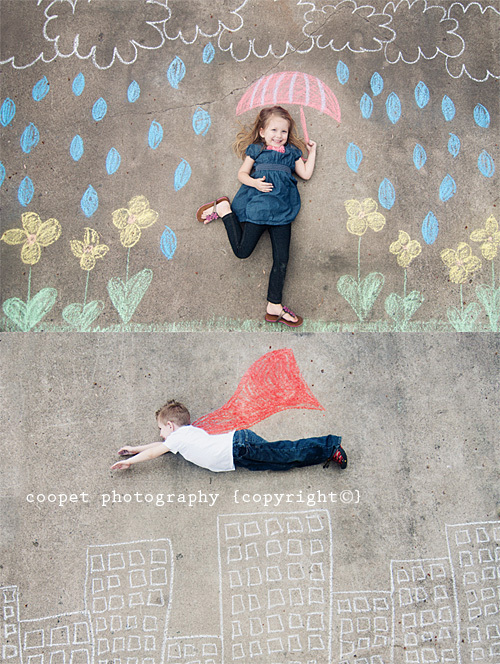 Last year we did some really fun chalk pictures & the kids have been itching to do more. So we busted out the chalk & did a few pictures. It was fun. Kegan wanted to do a Super Hero theme since that is his current obsession (next to Lego's) and Karie wanted an umbrella & some flowers. Both turned out adorable. Pretty sure we will have to frame these ones on their walls. These would also make a FANTASTIC addition to any photoshoot! The possibilities are endless!